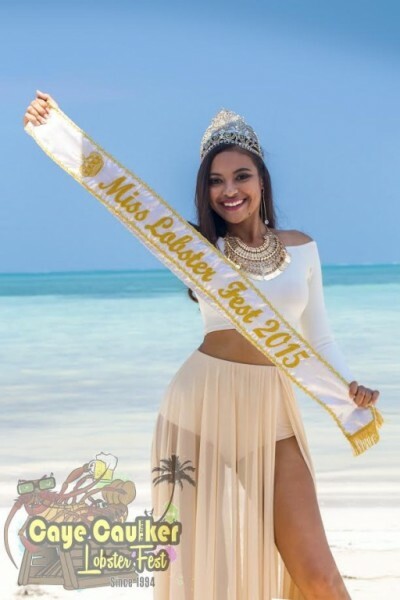 Home » Pageants & Beauty » All set for Caye Caulker Miss Lobster Fest Pageant! Lobster Season is open again and with it comes the fun and traditional lobster festivals around the country. All is ready in the neighboring island of Caye Caulker, where the festivities for their 23rd Annual Lobster Festival will take place from June 30th through July 2nd. The anticipated event will tip off with the Miss Lobster Fest 2017-2018 pageant, which will see four lovely young ladies vying for the crown and fabulous prizes. Aaliyah Elijio, Aleizy Durantes, Annabella Requena, and Katleen Cutkelvin will compete to become Caye Caulker’s next beauty ambassador in a talent, costume and question and answer segment. At 16 years of age Aleizy Durantes, is the youngest and tallest contestant this year. Swimming and water sports have definitely become her favorite hobbies since moving to Caye Caulker nine years ago. This compassionate young lady loves animals and cares a lot for the environment and urges everyone around her to do the same. Durantes is attending Ocean Academy high school in Caye Caulker, leading into her third year coming this August. She believes that everyone can accomplish anything they set their mind to. Aaliyah Elijio is 17 years old, and loves being in front of the camera. As such, her hobbies include modelling and keeping up with the newest makeup trends. Elijio enjoys jogging as a way to expand energy and stay fit. The third-year Ocean Academy student hopes that one day cyber bulling can be stopped, and looks forward to a peaceful world. Katleen Cutkelvin is a 16 –year- old recent graduate of San Pedro High School. She is looking forward to further education and become a teacher or a flight attendant. Cutkelvin says her ambition in life is to travel the world, as she loves adventures. She enjoys playing volleyball since she was inspired by both her mother and uncle who played semi pro volleyball. As a more athletic girl, Cutkelvin’s only owned her heels after entering this year’s pageant! After the first month of practicing in them, CutKelvin said her confidence rocketed, as she was able to walk down the red carpet at her prom in heels. Annabella Requena is 16 years old and a recent graduate of Caye Caulker’s Ocean Academy. With plans of furthering her education, she is currently working part time to gain work experience in the business field. One day she hopes to become a responsible business owner on Caye Caulker. Requena represented Belize in Washington DC USA earlier this year at the Central American Youth Ambassador’s summit. She works along with the Crocodile Research Coalition to capture and tag crocodiles for research, and in her spare time loves working with children, teaching them yoga. She is also a certified scuba diver and was valedictorian at her high school this year. Throughout the pageant, spectators will be entertained by live dance and musical performances. Judges will be tasked with selecting the winners for Miss Cooperative, Miss Amity, Miss Popularity, Miss Creativity, Miss Photogenic and of course, Miss Lobster Fest. Reigning Miss Lobster Fest 2015-2017 Aricelli Cadle will be present to crown her successor. The Caye Caulker Lobster Fest Committee invites everyone to come out for a fun filled weekend. There will be great activities for the whole family, including the Glow Fete, Color Explosion Beach Party, a DJ competition and even a Foam Party. Of course, there will be delicious lobster dishes to enjoy. Sponsors for this year’s festivities include: Belikin Beer, Coca Cola, Caye Caulker Village Council 2016 -2019, Belize Tourism Board, Caye Caulker Children Fun Drive, ONE BARREL RUM, Rainbow Hotel, Sophie's Guest Rooms, Pancho's Villas, Northern Fishermen Coop, Tropic Air Belize, Tropical Paradise Hotel, La Isla Resort, Island Magic Beach Resort, Caye Caulker Plaza Hotel, Atlantic Bank, Purple Passion Beauty Studio, French Angel Expedition Caye Caulker Belize, Amor Y Cafe, Caye Caulker, Belize, Anchorage Resort, Caye Caylker, Belize, J & SONS Xtreme Karts, Jan's Hotel Belize, KREM FM 96.5, 91.1, 101.1, De Real Macaw Hotel, Fantasy Dining "wine n' dine on island time", KOKO King, Rainbow Restaurant, Sip n Dip Beach Bar, LED Belize, Rapidito Construction Depot, Ocean Ferry Belize Limited, Lizard Juice Bar, San Pedro Belize Express Water Taxi, Prescription Value Pharmacy, Caye Caulker accommodations, Mr. Brian & Mrs. Zaira Mcwhirter, St. Francis Xavier Credit Union, Alta Vista Vacation Home, Happy Lobster Restaurant, Hon. Manuel Heredia Jr., El Capitan Marine Hardware Costa Maya Beach Cabanas, Sea Dreams Hotel, Caye Caulker, Belize, and Gentrac Belize. 2017 Caye Caulker Lobster Fest canceled; San Pedro and Placencia is still a go!